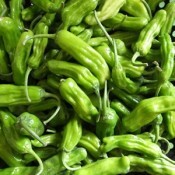 Shishito peppers have long been popular in Japan and now have gained much notoriety in the local food scene. The compact and bushy plants are well-branched and have very high yields. The 3-4 inches long fruits start off glossy lime green and will mature to a red colour. Whether roasted, grilled, sauteed, or deep-fried for tempura, these wrinkly, thin-walled peppers are rich in flavour. Typically, they are mild tasting, but about 1 in 12 peppers may be spicy or pungent. Connoisseurs play a game of pepper roulette.This marvel is one of the unique characteristics of Shishito peppers. Some fruit tend be spicy if they are harvested larger and more mature or if they are grown in changing climatic conditions, likely stressed conditions like hot and dry conditions. Continuous harvesting, 1-2 times per week encourages the plant to set more fruit and really produce more peppers. Use a sharp knife or pruning shears to snip off peppers leaving a short stem attached.